Frank Quattrone, the Godfather of tech investment banking, sat down in a fireside chat with Michael Arrington today at Disrupt. Quattrone is back in tech boutique M&A with his new investment advisory firm, Qatalyst Partners. Recently, he advised Palm on its $1.2 billion acquisition by HP and two years ago he worked for Google when it tried to cut a search deal with Yahoo. Arrington: You were involved with Apple’s acquisition of Next that brought Steve Jobs back Your advice was to do that deal or not do the deal? Arrington: Tell me about the early days. Quattrone: I joined Morgan Stanley in 1977, when it was less than 1,000 employees, and was in one business, advising companies. When I was in my second year at Stanford Business School, a professor brought in Steve Jobs before they had an IPO. I thought I was a hotshot. But here he was the same age as me, 25, about to IPO for a few hundred million dollars. I basically scratched my head and asked how did he do that? Steve Jobs did tell us how PCs were going to change the world. He had to sell his Volkswagon van for $800 to get Apple started, so it was very inspirational. Arrington: You formed Qatalyst Partners in 2008 to counsel companies and the very first thing you did was advise Google. There was a Microsoft -Yahoo takeover bid. Quattrone: Yahoo had proposed a very complex deal to Google. We explained to Google how much leverage they had in that situation, and that they could just do a search deal. Arrington: Are there any other deals you have worked on last few years? Quattrone. There was a bidding war for Data Domain that ended in an attractive sale of $2.4 billion to EMC. Arrington: Do you ever forget how much money you are dealing with. You are tossing around $2.4 billion. What is that world like? Quattrone: I did not start that way. At Morgan Stanley I was known as the guy who did small deals for small companies. The head of investment banking asked me why do you keep doing all of these small deals. What does Cisco do That was in 1990. For the first ten years it was a tough climb up a steep hill. Arrington: How is the venture capital industry doing? Quattrone: It Is not a pretty place to be unless you are one of the top ten firms with demand pull. It’s been a perfect storm. The last vintage of funds that have made any money for investors was 1998. That is not an asset class. Part of the problem is that it has become tougher and tougher to get companies public. Arrington: Going public now takes ten years. Quattrone: The bar has been set higher to go public. For the VC market to produce above average returns you need there to be an IPO market. In the 1990s the venture community would get 50/50 liquidity from IPO and M&A. The IPO deals have the long tail, if you hold onto the stock they have a ride. If you lose those longtail returns you lose a lot of the returns. Arringtone: John Doerr sees the third wave of disruption. The PC was the first, The internet was the second, and right now we are in the start. of third wave. He talks about mobile, social, and changes in commerce. Do you agree? Quattrone: We do ride phases in this sector. A lot is happening at the convergence of mobile, social, local, and realtime. I first got Twitter when my daughter was in New Zealand and they had an earthquake. I entered the town and there were twelve posts. Twitter and people dealing with this realtime world have a huge advantage over the status quo. Arrington: What is your Twitter account? Arrington: What needs to happen for that to change, to get more IPOs? Quattrone: I think the IPO market has been savaged by two different downturns. IPOs are more risky than average investments so when stocks are down, IPOs are down more. In my heydey at Morgan Stanley, when we were the leader, 80% of the deals were Robertson Stephens and other boutiques. The companies need to trust the boutiques. The other thing is that mutual funds have grown by 200X over the last 30 or 40 years. A $1B mutual fund that is now managing a trillion dollars doesn’t care about an IPO. There are probably 40 to 45 IPOs on file. They are not the category-defining, earthshaking companies the market wants to see. The market wants to see Facebook, Twitter, Zynga, LinkedIn, Skype. They want to see the companies that are changing the way we live. Arrington: Twitter and Facebook and Zynga are changing the culture of the world. Does one of them have to go public first? Who is the standard bearer this time? Quattrone: It could be any of them. 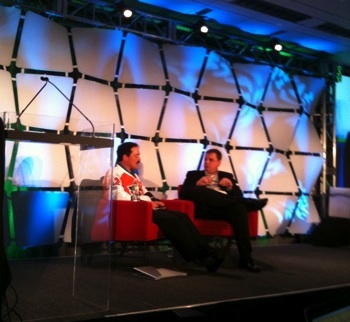 Arrington: Facebook could be, LInkedIn could be, Zynga could be? Quattrone: Sure, Zynga is a whole new way to do social gaming. Quattrone: I personally am not much of a gamer. Arrington: What is the most secret thing you know? A: The personal chemistry between me and the CEO is what sealed the deal. How is Carol doing? Quattrone: I think she has done a great job. I harken back to when IBM lost its way and Lou Gerstner came in. Everyone bugged him about his strategy. Unless you got the fundamentals right . . .
Quattrone: Potentially, yeah. Look at how much time people are spending on Facebook. I think it was important that Zynga recently renewed that deal. Because developers are asking where can I make money? Arrington: If Facebook were public, how big would it’s market cap be? Quattrone: 18 Gazillion dollars. I have no idea, I don’t know what their revenues are. Arrington: I bet you do know.